Many Private Sale Boats Available too! Used boats are priced for incredible savings to you and are based on overall condition. We keep a list of quality used rowing shells and family boats that are currently not listed on this page but are for sale an in our warehouse. Boats on this list are waiting to be placed on our site with pictures and descriptions. If you are interested in a rowing shell that is not listed on our used boat page please contact us via phone or email at the address below. Transportation of shells from our location to yours can be arranged. Freight charges are not included in the prices below. All Oarmaster Is, Oarmaster IIs and Piantedosi Ro-Wings have Concept II Oarlocks valued at $36.00 a pair. Discounts from lesson fees, discounts from demo fees and discounts from rental fees do not apply to the purchase of any used private or company rowing shell. These used shells are already deeply discounted and cannot absorb further price reduction. Adirondack Rowing is not the seller of some of these shells and does not take a commission from seller or buyer of private sales. Highlighted links will bring you to the information pages about the boats so you can read more about them. 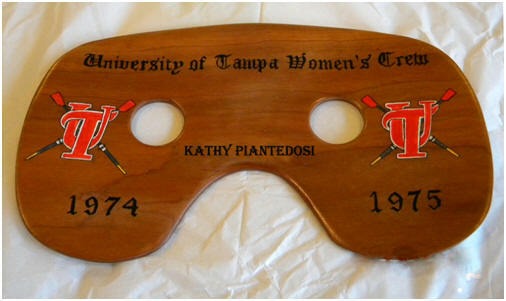 Beautiful, Affordable, Ornamental Rowing and Sculling Seats available with custom artwork. Absolutely memorable and beautiful with custom artwork and lettering for awards, ceremonies and gifts. Call or email for almost any request. This seat pictured sold for $195 with its beautiful woodwork and artwork. Remember, our wooden oars are equally as beautiful. Purchase any used shell with oars and receive free indoor storage until you are ready for delivery anytime in the spring of 2019. 1/2 price delivery charges, if delivery is needed. Anyone who shops for new ro-wing sculling units knows that it is a challenging effort. Due to our 46th consecutive year bringing the best new and used sculling products to the rowing public, we have availability for the ro-wing new at this time however, please purchase early as supply may ebb and flow at the height of the season. Our Ro-wings come with a very desirable upgrade of wood seat top and wooden feet, both more comfortable than composites. These upgrades are at no extra charge to our customers. 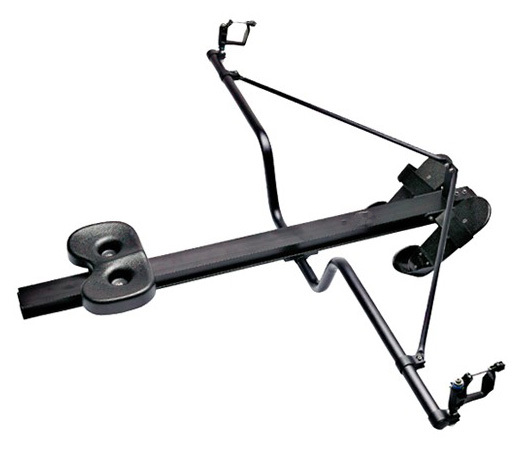 Anyone who shops for new Oarmaster III sculling units knows that it is a challenging effort. Due to our 46th consecutive year bringing the best new and used sculling products to the rowing public, we have availability for the Oarmaster III new at this time however, please purchase early as supply may ebb and flow at the height of the season. Our Oarmaster IIIs come with a very desirable upgrade of wood seat top, which is more comfortable than a composite. This upgrade is at no extra charge to our customers. We are offering these damaged shells at these prices when a pair of used sculling oars are purchased. If you purchase a pair of sculling oars, we will include the shell at the prices listed above. The buyer will be responsible for the repairs and any missing parts. We are able to provide transportation for these shells, though the shipping will be at the buyer’s cost. These shells are currently UNROWABLE and are being sold in “as is” condition. They are in need of either fiberglass repair, wood repair, and/or parts. 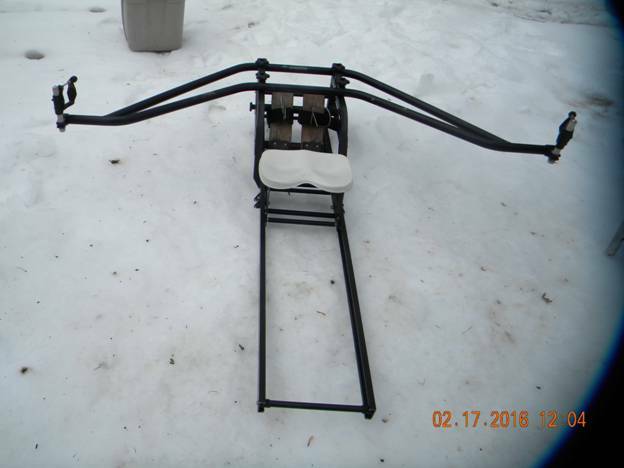 Midweight Single – $500 – unrowable – could be used for ornamental. This shell is an older Peinert. This boat is pretty light, kevlar and a honeycomb hull. The buyer could make modern tracks fit with a little grinding and can order a Dreher seat to fit. A footstretcher would have to be fabricated and a way to mount it as Peinert doesn’t have anything that will fit this boat, but that is not beyond the range of many amateurs. Heavyweight Single – $500 – unrowable – could be used for ornamental. Drift Boat – $450 – rowable but needs rowing unit and oars. Composite Double – $975 – Ok condition. Rowable. Comes with two Oarmaster I rowing units with brass oarlocks and two pair of wooden sculling oars. Used oars arrive and are sold regularly, year round, so oars that are posted on our website currently may have sold by the time a buyer calls. If that happens, we do have other used oars available. Please call for current list. The Oarmaster IV was built with a fiberglass base and an Alden Star geometry. This Oarmaster will fit into the Alden Ocean Shells and the Appledore Pod Shells. 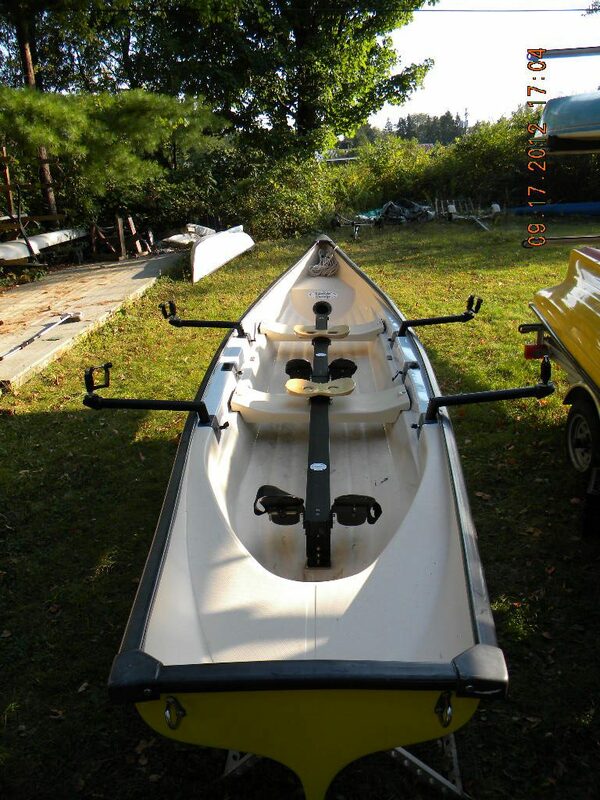 This Oarmaster IV is in like new condition as you can see by the photos. Please email for current pictures of our Oarmaster I units. These units are in very nice condition and have been inspected and tuned up by us. Many of the Oarmaster Is has been upgraded with new Concept II oarlocks, “C” spacers and new custom high grade stainless steel oarlock pins and footstretcher velcros (A value of $150). We have one LRM Monorail. The rail and feet are in good condition. The wheels are functional but will need to be replaced very soon. Selling as is. The Oarmaster IIs are in good condition. They roll quiet and smooth. The used Oarmaster IIs comes with Concept II oarlocks. These Oarmasters are in short supply this entire season. $795.00 new, plus freight. We have two pair of Deltor sculling oars left that are in very good condition. 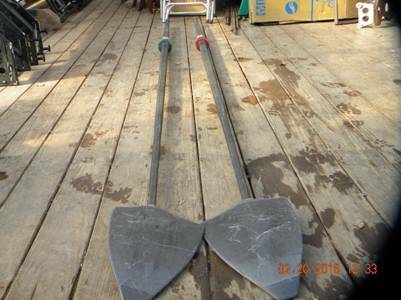 These oars are NOT able to be shipped by UPS or FedEx due to their length. They need to be picked up in person or shipped with one of our boat freight carriers. This canoe is outfitted with a Piantedosi Ro-wing with canoe adapter kit and a pair of sculling oars. this canoe sculls nicely in calm or rougher water. It is in average to good condition. Please email or call for pictures. This canoe is in good condition. It comes with two pair of aluminum paddles with black plastic paddles. This Oarmaster I is in good condition overall. Though this rowing unit is not cosmetically pretty, it does function well. The anodizing on this rowing unit did not hold up so over half of the rowing unit is showing the aluminum. A good sanding and spray paint will bring this rowing unit back to looking new. This rowing unit comes with a new wooden seat top, new velcro straps and new stainless oarlock pins and Concept 2 oarlocks. This canoe is in very good condition. It comes with a pair of wooden paddles, a pair of aluminum paddles with plastic blades and seat cushions. If you do not see a used rowing shell that you want or need on this page, please ask us if we have it or know where to get one for you. For every picture of used boats on this used boat page, there are at least two boats that have just arrived and are waiting to be posted on the used boat page. The used smoke white Alden Star is in OK shape, lacking cosmetic appeal. It is sound and comes with a pair of composite oars. This boat has a great hull design and beautiful lines too. The hull is a beautiful red with a few minor scratches but with no damage and no repairs. The gunwales and some spots on the decks need light sanding and varnishing in spots. This boat comes with a new Piantedosi Ro-wing new adjustable handle composite sculling oars, still in the wrapper. Chesapeake Light Craft Expedition WherryThis Wherry and the Ro-Wing drop in sculling unit are only three months old and look to be in very nice condition. This Wherry does not come with a pair of sculling oars, however, we have a large selection of used macon, deltor and hatchet sculling oars that would pair nicely with this Wherry. The Wherry and Ro-Wing are located in Cape Elizabeth, ME. This Alden 16 is in overall good condition. It does have a cracked splashguard as shown in the picture. This Alden 16 comes with an Oarmaster I rowing unit, a pair of composite deltor sculling oars and a snap over cockpit cover. This Alden 16 is in overall good condition. It does have a cracked splashguard as shown in the picture. This Alden 16 comes with an Oarmaster II rowing unit, a pair of composite deltor sculling oars and a snap over cockpit cover. This package can also substitute a pair of composite macon sculling oars for an additional $100. This Alden 16 is in overall good condition. It does have a cracked splashguard as shown in the picture. This Alden 16 comes with an TESLA rowing unit, a pair of composite deltor sculling oars and a snap over cockpit cover. This package can also substitute a pair of composite macon sculling oars for an additional $100. This Alden Quest is in very nice and almost like-new condition, It comes with a pair of composite light weight macon sculling oars. This Alden Ocean Shell is in overall good condition though there are scratches on the deck and hull from use. This is an older Alden 18 but it is structurally sound. This Alden 18 comes with two sliding seat Oarmaster rowing units and two pair of composite sculling oars. This 15 foot guideboat is in nice condition. There are some scratches on the hull from use. The wooden oars are cherry and are in nice condition. This Appledore Pod 16 is in good condition. This boat comes with one sliding seat rowing unit and one pair of composite sculling oars. Please email for more pictures. This yellow Alden Star looks to be in good condition. This Star comes with a pair of light-weight composite sculling oars. This Adirondack Wherry comes with one Piantedosi sliding seat rowing unit and one pair of composite sculling oars. 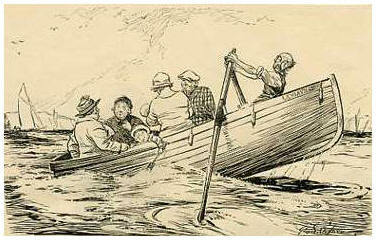 This boat can row as a single, a double or as a single with passenger. This Wherry comes with one drop in unit and pair of oars. We can provide a second rowing unit and pair of sculling oars if you would like to row this Wherry as a double. This Wherry has wooden gunwales and nose and bow pieces. The boat is in good condition. This MAAS Aero is in good condition. It has a white hull and white deck. There are some scratches on the deck and hull from use. This Aero comes with a pair of composite ultra-light sculling oars and a pair of storage slings. 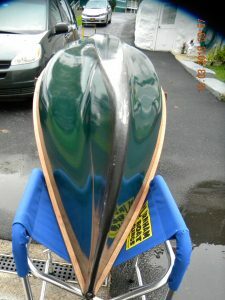 Overall good condition with brand new Concept II Bantam oars Package, new over $6,800, with freight to the East Coast. Purchased new in 2014, this Guideboat is rigged as a double with two Piantedosi sliding seat rowing units and two pair of sculling oars. This boat has been gently used for four seasons. It has a newly refinished hull, compounded, polished and waxed. Wood trim has been stripped, sanded and refinished with five coats of spar varnish. Two new seats as well. Boat dolly is included. This boat is located in Northeast, MD. This Adirondack Wherry comes with two Piantedosi sliding seat ro-wings and two pair of Dreher ultra light adjustable handle composite macon sculling oars. This wherry is in good condition though the woodwork needs some sanding and varnishing. This Guideboat 15 come with a Piantedosi Ro-Wing and a pair of carbon fiber ultra light sculling oars, Trailex Trailer and boat dolly. The boat is in good condition and the trailer has only been used a few times. Guideboat and trailer is located in Manchester, VT. This LRM Heritage 15 is rigged as a single and comes with one pair of upgraded composite ultra light oars. New, this package sells for over $6,295. The Thompson Dory is also known as the Gentleman Dory. The boat is 15 ft long 4 ft wide and weighs about 95 lb. It is glued lapstrake construction with a fiberglass layer on the bottom and a brass half round strip on the keel and stem. Transom is mahogany, seats are white pine and the gunwales and breast hook are teak. It has cedar floor boards with a foot stretcher and comes with 8 ft spoon oars. The boat has been in the water 5 times and is in excellent condition. This Heritage 18 is in overall good condition. It comes with two sliding seat rowing unit and two pair of composite, ultra-light macon sculling oars. This double is in good condition with no damage or repairs. This shell comes with two pair of new macon or hatchet sculling oars, buyer’s preference.